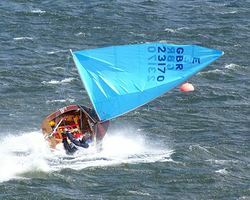 The Enterprise dinghy is a two man racing dinghy designed in the 1960s by Jack Holt. 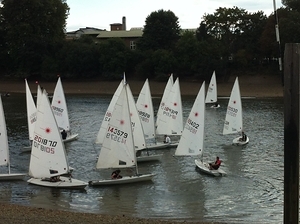 They have been sailed at London Corinthian Sailing Club for many years. Due to limited space in the club under-crofts and the Thames being a narrow and fast flowing tidal water the Enterprise is ideally suited. The fleet of five maintained club Enterprises are available for members to hire for racing or cruising. Modest changes in class rules over the years means the Enterprise remains an affordable sailing dinghy for all budgets. As the Enterprise is a two man dinghy it is popular with couples, friends and experienced sailors looking for a simple sailing boat. The recent introduction of the Mk III design having a double floor hull and self draining cockpit provides the advantage of recovering from a capsize almost empty of water. This is not to be underestimated ! The Enterprise is great for novices looking for that something extra in performance. At the club we want to see members progress from Vision to Enterprise. 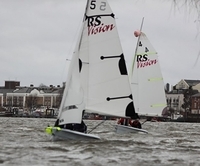 Freeing up Vision dinghies to allow the following years beginners and novices to come through. That progression means learning new skills to sail an Enterprise. At London Corinthian SC we endeavour to help members gain through tuition all necessary skills to sail safely on the River Thames. Made available by the club are five Enterprise dinghies for members to hire. Four are Mk I Glass Reinforced Plastic (GRP) construction with aft main-sheet configuration. The fifth is a new Mk III GRP with centre main-sheet that matches the Vision training boats. Gaining the skills to use the different main-sheet configuration can be provided by the club. Just ask the training instructor for more information about Helming courses. The RS Vision is an easy to handle, all round boat that's great for training, cruising or racing. There's lots of space – you can get 3 people in a Vision, and the boom's nice and high so you're less likely to bump your head! It's also very stable which makes it perfect if you're just getting into sailing. If you do capsize though, it's easy to right and, with its self-draining cockpit, it comes up dry. For a bit more excitement, the Visions also have spinnakers. We run day courses to learn out how to use them or just find someone experienced who can show you how it's done. We use Visions as our training boat for RYA level 1&2 courses. 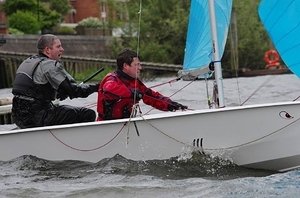 Once you've done your course, it's a good idea to get out on the river straight away and riverbanking or wacky racing in a Vision is a great way to build up your confidence and meet other members to sail with. Alternatively, you can always take a Vision out for a cruise when there's racing on. It's good to see a race in action and build up to racing. If you're up for racing, there are two types of races to compete in. Either one of the Points Series on a handicap basis, or in the Cup Races where there is our very own Vision Cup to be won. The Laser quite simply is a design classic: it is as groovy now as it was back in the Swinging Sixties when it was conceived. There are over 200,000 dinghies worldwide: robust and simple to rig and sail, it affords very competitive, one-design racing at every level. It is ideal for those who like a touch of athleticism in their sailing, but still requires guile and craft to sail competitively in all conditions. ….so maybe that should be 3-design racing. Welcoming at entry level, yet with the target of top competition, the Laser has been an Olympic class since 1996. At Corinthians, we pride ourselves on having a competitive fleet with a wide range of abilities from novice to international level with the facility to develop at every step of the way. 30 sailors have their own boat at the club and on any one weekend, there might be 10 -15 Lasers manoeuvringfor optimum position on the line. 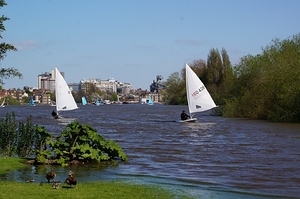 Sailors are encouraged to sail on the wider circuit and the Thames Valley Cup is popular for the more adept. The Laser was originally designed to transport on top of a car but most find a road trolley easier. There are 5 club boats for hire and new sailors have smaller rigs at their disposal to ease learning. You will easily transition from RYA 1 and 2 via wacky racing, river-banking, laser classes, cruising during race events, racing, club sailing trips and lots more. You will have the freedom to learn at your own pace and with the added advantage of only having responsibility for your own swimming opportunities. 15 minutes before the start the more competitive might have their "sailing faces" on, but catch them at any other time and you will find them an affable, supportive bunch who will be glad to help with rigging and tips. Generally, on any river-banking or wacky racing evening, there will be an experienced Laser sailor to help you on to, on, and off the water. And expert sailors of a smaller build should not be concerned about their ability to compete: smaller rigs have a favourable yardstick in cross-fleet, Handicap Races; and Radials compete for their own prize (as well as the overall prize) in Laser races. We are committed to growing the fleet at every level of competition and out-and-out, sheer enjoyment.